As we have pointed out on many occasions, the pro-Kremlin outlets love conspiracies. And the more shocking these conspiracies are, the better they serve the purposes of the disinformation campaign. For understandable reasons, the most shocking conspiracies include stories about violent death. And since it is impossible to keep on recycling e.g. the infamous story about crucified boy or the story about nazi zombies in Ukraine, the campaign has to come up with new ways of telling stories about people suffering a painful death. It is against this background that pro-Kremlin outlets regularly spread invented stories about chemical laboratories developing secret weapons, which have to be placed near Russia in order to appear really dangerous. On the other hand, the countries bordering Russia usually lack the financial resources they would need for building huge biological-weapons laboratories. At this point, the usual villain of the Russian media comes up. Of course, these secret laboratories developing chemical and biological weapons that will be used for attacking Russia are funded by no-one else than the United States of America. In the Disinformation Review, we showed an example of this recurring disinformation already one year ago. This summer, this particular disinformation story received a new spin: as the International Business Times have reported, hackers from CyberBerkut have allegedly gained “proofs” that US is covertly testing chemical warfare in Ukraine. Just to remind: CyberBerkut is a hackers group known for claiming cyber-attacks against NATO or German Chancellery and Bundestag. “CyberBerkut is a front organization for Russian state-sponsored cyber activity, supporting Russia’s military operations and strategic objectives in Ukraine,” writes the Defense Intelligence Agency. “It is perhaps one of the most blatant examples of the Kremlin’s propaganda machine in action – a toxic blend of hacking, misinformation and spin,” so the International Business Times described the latest operation. CyberBerkut’s “revelations”, which have been reported by a wide net of pro-Kremlin outlets, say that the US have sponsored at least 15 biological facilities in Ukraine. In addition, they claim that the Americans intentionally spread lethal infections in the country that is currently at war with Russia. Needless to say, no credible media followed the lead unleashed by CyberBerkut. “At the time of writing, only Russian state media had covered the hackers’ claims,” concluded the International Business Times. 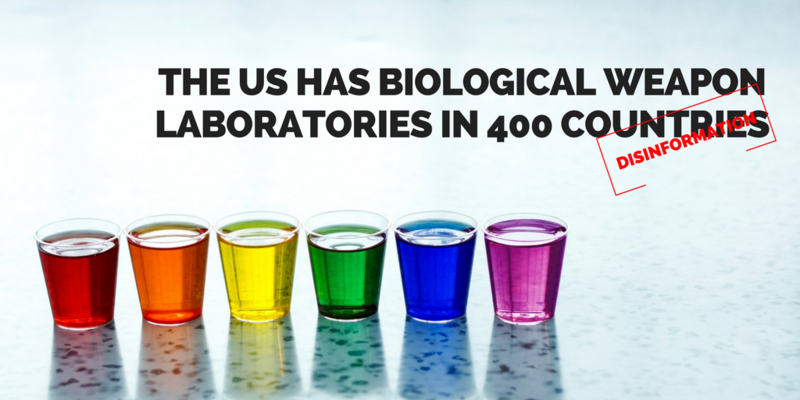 The US have such laboratories in 400 countries of the world! One more country that has plenty of experience with false claims about American biological weapons laboratories is Armenia. The Union of Informed Citizens NGO has devoted a full study to this phenomenon. According to Russian and Armenian disinformation-oriented outlets, laboratories in Yerevan, Gyumri and Iljevan have “dual function” and “pose a danger for the population of Armenia”. In June, this even led to a protest near the US Embassy in Yerevan. According to the study, “The protest was widely covered by the media in spite of the fact that a number of absurd ideas were expressed there (for instance, the claim that the US has founded such laboratories in 400 countries of the world).” Just to remind, there are 195 countries on planet Earth today. As the Union of Informed Citizens has discovered, authors of the publications are pro-Russian groups that spread disinformation through Russian or pro-Russian websites. You can read the full report here.